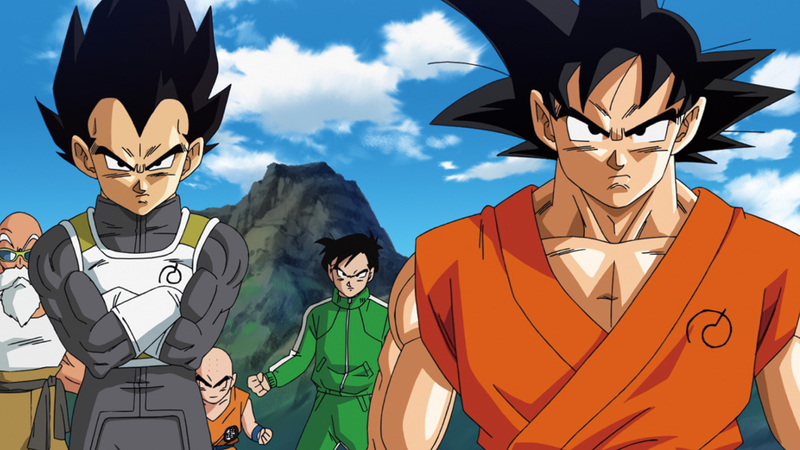 There are few things from Japanese media as influential as the Dragon Ball franchise. The original manga ended fifteen years ago, yet it continued strongly in ovas, collectibles, and video games. If one is even just a casual anime/manga fan, Dragon Ball is known. The Z saga’s writing and engagement often transcends what is seen today. There’s something compelling about a character whom deals with literally the definition of overwhelming odds. (This popular concept originated there.) Its fanbase is one of the most passionate of the anime/manga landscape. That’s why when Battle of Gods saw release two years ago it garnered a massive amount of hype since it was the first major DBZ movie production since Wrath of the Dragon fifteen years prior. It had some problems but overall it was a solid way to bring back the characters. For the sequel, which sees release in limited theaters nationwide on August 4, it brings back the most iconic villain of the franchise, Frieza. Cell and Buu have many fans and are great characters, but Frieza is often regarded as the face of villainy in the franchise. Even series creator Akira Toriyama (whom wrote the sreenplay) considers him the most brutal, since for this film’s release he’s quoted with saying, “He’s the most heinous villain in the series.” Of course, this isn’t the first time Frieza has been resurrected. He was brought back in the film Fusion Reborn briefly. (Though it’s left best forgotten, even this film ignores it, further clarifying all the older movies are not canon.) Resurrection ‘F’ is a true villain-brought-back-from-the-death story, and is immensely entertaining. It has a few of the same problems with Battle of Gods, but the title villain here makes it a more fun watch. There are few franchises which characters command a presence such as in Dragon Ball Z. When Frieza is officially resurrected the viewer can feel the terror that after all these years, this guy is back. At first it worried me that there would be no explanation as to why now he’s being resurrected, but thankfully it’s explained. Before we get into the core of the film, let’s talk about what happened in the intro. 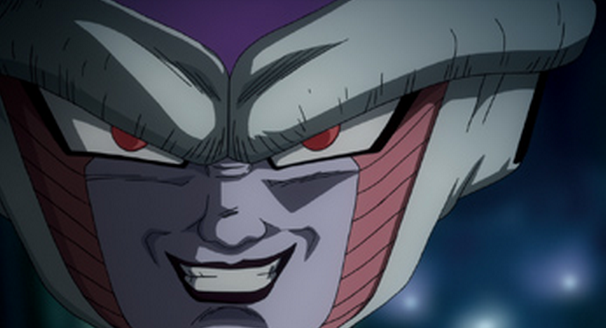 Sorbet and Tagoma are established as main characters leading the front for Frieza’s resurrection. Unlike many other subordinates in the series, these two are pretty solid, especially Sorbet. When Frieza is resurrected however, they’re pushed to the side vastly. This makes sense, but one has to wonder what was the point of establishing Tagoma as a prominent character on the poster then after 20 minutes he stops having a role. I suppose it’s a small thing in the long run since by the time Frieza has gotten to Earth the viewer is too involved in that to really care too much. Shenron’s summoning is still awe-inspiring, and looks better than ever in HD. His response to Sorbet’s wish to bring back Frieza was priceless, “A foolish choice, but very well.” Unfortunately just about the entire intro is accompanied by the trio of Pilaf, Shou, and Mai. These three served no purpose other than for comic relief in Battle of Gods, and it’s the same here. Thankfully, after the intro they’re nowhere to be seen. Also, they’re used to take away what could have been a great revival for one of the most under-represented characters in the series, which is a grave shame. The main action is of course when Frieza and his army of 1000 come to Earth. The stakes are high as he shows his lack of mercy by destroying a city to acquire Goku’s attention. That scene alone reminds the viewer this is Dragon Ball world where characters shoot a laser and whole cities to planets are wiped out. It was definitely a treat seeing Piccolo, Krillin, Tien, and even Master Roshi teaming up against Frieza’s men. It felt like a hold-over for the main conflict, but it’s hard to complain with such great animation. It actually takes quite a bit for Goku and Vegeta to appear, but once they head back to Earth from training with Whis they easily take center stage. Before we dive into the best parts of the film, I want to talk about Beerus and Whis. These two were most certainly intriguing characters in Battle of Gods. Here though, especially Beerus, are almost parody-ish. The fact that they’re present during the final battle takes away some tension since they’re literally stronger than everyone else on the battlefield. Whis unveils an interesting new ability, though it’s used as a dues ex machina, which is a shame because it eliminates the intensity of the climax. The final battle is divided into a few different segments, each with fantastic choreography and blows given. The viewer can try to locate a more epic battle scene from this year’s movie offerings; they wouldn’t be successful. There’s no getting around it: at its peak, Dragon Ball has some of the best fight scenes from media. Golden Frieza vs. Super Saiyan God Goku does not disappoint in the slightest. The final showdown and the engaging dialogue between the two characters is worth the price of admission alone. Of course, this and all other scenes of the movie is accompanied by a stellar soundtrack, one of the strongest soundtracks in the franchise yet. 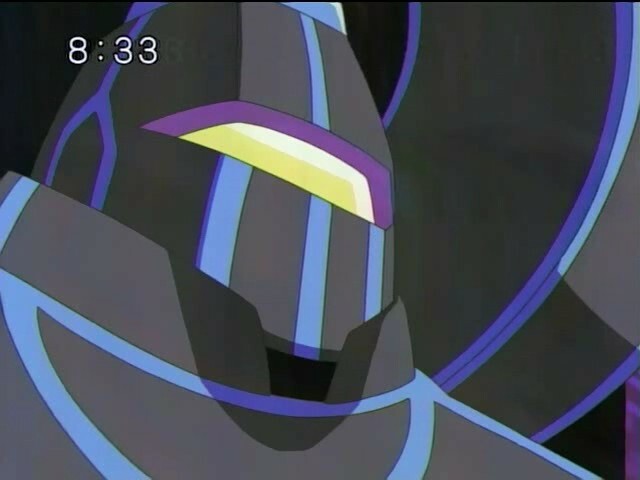 The choir which plays during Frieza’s transformation into his new golden form makes the viewer forget about everything in real life as he/she is engaged by the awe. Best soundtrack of the year? I would say so. Overall, Resurrection ‘F’ is a very fun film from beginning to end. Frieza is a fantastic character and it’s great to see him finally get a true return story. (Since Fusion reborn and GT are best left forgotten.) There are quite a few factors which could be eliminated (the trio) but with such great fight scenes and dialogue throughout, it’s hard to complain too much. The return of Whis and Beerus is a bit disappointing since they don’t actually do much and are basically plot devices, especially for the climax. (Hopefully in the sequel they’re given a little more purpose other than for comic relief.) The final battle is satisfying and definitely more engaging than the climax in Battle of Gods because of the history between Goku and Frieza. Resurrection ‘F’ doesn’t quite the reach the excellence of classic films such as Cooler’s Revenge and the underrated Wrath of the Dragon, but it is nonetheless a worthy addition to the series. A big thanks to FUNimation, don’t forget to order your ticket!